The Second RSNOG Conference was held 22nd November at the Crown Plaza Hotel, supported by RNIDS, RIPE NCC, Interxion, SOX and Mainstream. The conference brought together some 120 network professionals from the major local telecommunications companies, cable operators and Internet and hosting providers (Vip Mobile, Telenor, Telekom, SBB, Pošta Srbije, Orion Telekom, Serbian Open Exchange, Mainstream, Radijus Vektor, AVcom, Beotel, EUnet, Sattrakt), Serbian IT companies (Pupin Telekom, RT-RK, Asseco SEE, Algotech), academic institutions (University of Belgrade Faculty of Electrical Engineering, Belgrade Faculty of Organizational Sciences, Niš Faculty of Electronic Engineering, Faculty of Security Studies) and state institutions (Ministry of Education, Science and Technological Development, Ministry of Trade, Tourism and Telecommunications, Ministry of Defense and the Serbian Army, RATEL, CROSO, RFPIO, UZZPRO). The conference was additionally watched by several hundred people via online stream. The RSNOG Conference was opened by Dr Vladica Tintor, Director of the national Regulatory Agency for Electronic Communications and Postal Services, after which there were six talks on varying topics such as modern data-centre design and the security of network infrastructure, critical services and user content on the Internet, as well as a presentation of a project to establish an Internet traffic exchange point in Niš, and of the activities of the Southern Serbia Administrators’ Association. This year at the RSNOG Conference, for the first time, an Internet network knowledge quiz was held, with first and second prizes Arduino and Raspberry Pi kits. 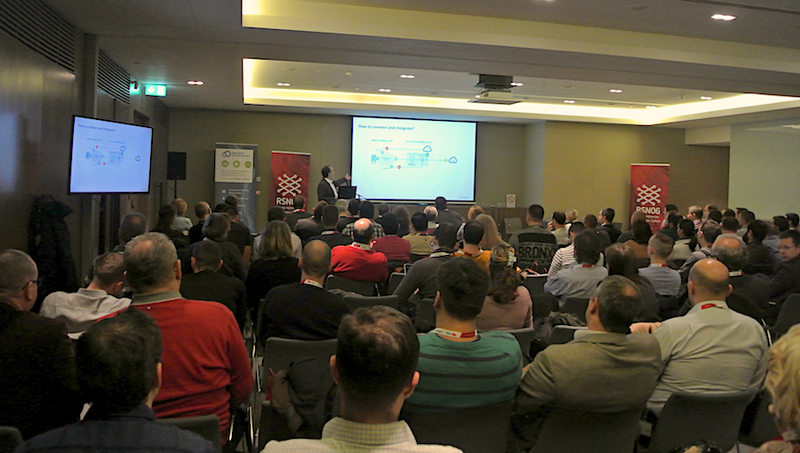 As last year, the RSNOG Conference generated increased interest in the RSNOG community mailing list, which gained some sixty new members and now boasts more than 220 network administrators and other members of the Internet technical community in Serbia. All presentations, recordings of talks and photographs from the Second RSNOG Conference can be found on the RSNOG community website. Réseaux IP Européens Network Coordination Centre (RIPE NCC) coordinates the forum of European IP networks, as one of five global regional Internet registries (RIRs), responsible for the territory of Europe, the Middle East and Central Asia. The members of the organization are local Internet registries to whom RIPE NCC allots the IP addresses and AS numbers which are essential for the functioning of the Internet. Interxion is a leading provider of carrier- and cloud-neutral collocation data centre services in Europe, with more than 1,500 users in 42 data centers across 11 countries. Interxion provides services to more than 600 ISPs and 21 Internet exchanges across Europe. SOX (Serbian Open eXchange) is a platform for the exchange of Internet traffic, with open rules and transparent procedures, providing a backbone for use by Serbian and regional Internet companies, fixed, and mobile telecommunications operators, content providers, gaming companies and others. Mainstream has been providing advanced web hosting services since 2005, with 24h support and guaranteed 99.9% annual uptime for its clients. Mainstream hosts 8 of the 10 highest-traffic web sites in Serbia, as measured by the Gemius Audience rating.